Recent attack on Nigerian students in Noida by Manuwadi people might come as a shock to many around the world but not to people like me who know these lesser humans from inside out. The beating was so brutal that a sane person can’t watch such gruesome video scenes. The reason of this atrocity is more shocking. Some school kid died of drug overdose but no one knows who did supply. But Nigerians by their skin color by default found in their suspicion. Many Nigerians students in the locality were brutally beaten up. Shocking as may it sound Racism has its origin in India. This started after the arrival of the most wicked fair-skinned Aryans. They used terms like Dasa and Dasyu to refer to dark skinned-Dravidians. Many may not know Casteism is the earliest and most cruel of racism. The distinction is based on color. The so called middle castes were of later oirgin. 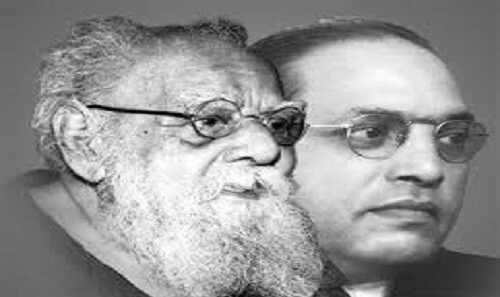 Even today, you can easily distinguish a Brahim and Dalit by their racial features. The Brahmins and many upper castes Sindhi and Punjabis in North India have fair skin and facial feature similar to Central Asian and Europeans, which natives like Dalits and Tribal approximate Africans. It is pity that modern definition of Racism does not include casteism as a form of racism though the racial features of people and discrimination and cruelty more severe than racism practiced in Casteism. Take for example the practice of untouchability. The Dalits have separate place to live and many public places like road, waterpump, ponds etc are not accessible to them. The so-called upper castes practice a form of total boycott against the Dalits. Even death does not resolve of the prejudice of these Manuwadi bastards. Recently, Gujarat assembly approved separate crematorium for so-called upper caste population and Dalits. The practice is there since time immemorial but it is first attempt to legalize this cruel form of inequality. One can easily see the mindset of these savages. The Manuwadis cry foul over slightest incident against them abroad but at home they practice racism of worst kind against the North east people, the Dalits and Tribal. The savage incident against innocent Nigerian students are eye openers for the world to see what a filth animal these Manuwadi beasts are. This entry was posted in Atrocity News and tagged black women attacked in Noida, dalits, nigeria, nigerian students were beaten up in noida, racism in india, separate crematorium for dalits, tribal on March 31, 2017 by NonIndian. Why Manuwadis Harp on Patriotism? The Manuwadi in India has held Patriotism to be the highest of all values. It is being propagated as the highest form of all virtues and every Indian must have it. Just having patriotism is not office, every citizen has to openly display it. The cunning manuwadi snakes have come out a hidden agenda to tighten their grip on masses and keep them further pauperized. The state, judiciary, police, media, so-called upper caste people and some brainwashed lower caste idiots all are party to this well-crafted propaganda. Every senseless act and talk of Manuwadi politicians and religious fanatics are being justified by masking it with patriotism mask. India (Bharat) is being portrayed as mother and every Indian should shout Bharat Mata ki Jai (Hail Mother India). The standard slogan ‘Jai Hind’ (Hail Hindustan) is not only replaced by Bharat Mata ki Jai but being mandatory for everyone to shout. Uttering the sentence , according to these Manuwadis, proves one’s patriotism. Their hidden targets are of course Muslims and Christians who are uncomfortable with equating a piece of land with mother and hailing an imaginary mother because of their religious belief. No other slogan except uttering this one supposedly proves one’s patriotism. The recent ill-conceived demonetization scheme has snatched livelihood of millions. 100 plus people died and business has been severely affected due to lack of demand. The demonetization which is nothing but legal plunder of people’s money sought to be justified citing ‘national interest’. Those who oppose are being shut down by drawing parallel with Army men guarding boarders day and night for national good. ‘When army men can stand on boarder for days to protect us, why can’t we stand before ATM for few hours for common good?’ is the standard reply these Manuwadi provide who disapprove demonetization. Recently, Dipak Mishar, a RSS affiliated Supeme Court Judge, has made singing of national anthem compulsory in all film theaters before movie screening. Such a move, according to this right wing judge, will inculcate feeling of patriotism and belongingness to nation. Interestingly the Supreme Court turned down to the plea to make national anthem mandatory before every court proceeding. So, What is the real motive? Emphasis on patriotism allows the Manuwadi to hide inhuman atrocities they have committed against indigenous people like Dalit and Tribal over centuries and which still go on unabated. While in liberal countries like USA and UK values like humanism, individual freedom, tolerance and respect for other ideas are given priority over patriotism in India patriotism supersedes all other values . Giving priority to ‘Humanism’ over other ideals will clearly expose these wicked Manuwadis. The issues faced by Dalits and Tribals are played down by diverting attention to so-called higher ideas like ‘common good’, ‘national development’, and ‘national interest’. The patriotism that Manuwadis profess is nothing but disguised communalism and stems from their intense open hatred for Muslim and Christian. The idea is to divide people in ‘US versus THEY’ line and reap political dividend. Unfortunately, the seems to have become successful and are being frequently used before election to polarize masses on religious and ethnic line. The real patriotism of these cowards Manuwadis are well known and documented. During independence struggle they sided with British and did not participate in freedom movements. India is such country patriotism is not last but first refuge of scoundrels, bigots, communalists and religious fanatics. Foul mouthed politicians, corrupt corporates, tax evading celebrities and even criminal gangsters justify their misdeeds by taking refuge under patriotism. This entry was posted in Perspective and tagged bharat mata ki jai, dalit atrocities, dalits, democratic ideals, humanism, indian communalism, jai hind, patriotism, tolerance, tribal on December 20, 2016 by NonIndian. The nation of barbarians and savages is at again. 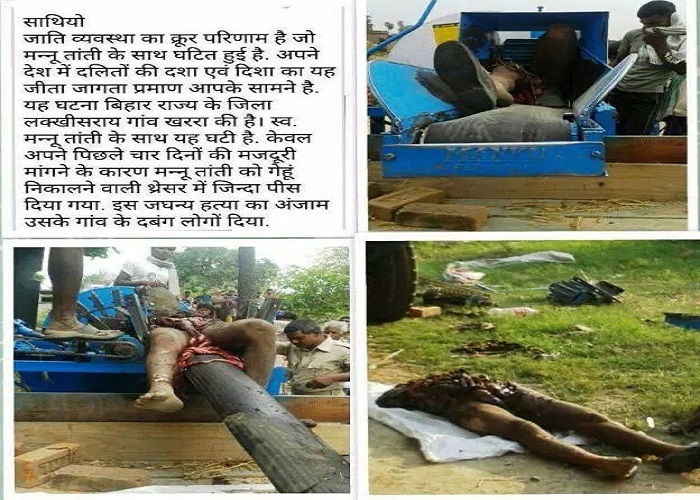 Not a single day passes without us hearing cruelties of these cruel beasts on Dalits in some part of India are other. These children of vermin continue to cause immense hardship and suffering to Dalits with impunity. They have no regret of their shameful past. They derive hedonistic pleasure from torturing and brutalizing Dalits every day. The atrocities these mortal vampires commit on Dalits can easily put to shame most horrific plots of scariest horror movies. Many ghastly incidents have been reported recently. Two cases here are worthy to present before world because the scale of brutality and the reasons are unparalleled in the contemporary world. Manu Tanti is a Dalit and daily laborer in Bihar. He was recently brutally killed by the so-called barbarian upper caste for demanding unpaid wage of last four days he worked. He was forcibly put into a thresher and the machined gored him into two halves just above his waist. This is what they do to Dalits for demanding something rightful. These evil beasts who wear the body of human are used to bonded labor since they established their hegemony in India. Murderous-blood of their forefathers flows in their wicked veins and arteries. They inherit the genes of one of the most evils people who lived in the planet. Let’s now go to the second case. This happened in Kyuri village in the state of Uttar Pradesh. A boy and his entire family were beaten up with sticks by goons led by a Brahmin named wicked Anil Sharma. The reason is very palpable. A boy belonging to the family had gone to purchase sweet from a shop belonging to a Brahmin and he accidentally touched the shop owner Anil Sharma. He gave a severe thrashing to the boy right there. When the family of boy protested late on, the shop owner took some goons and brutally beat up family members with sticks. They kicked in the stomach of a pregnant woman of the victim’s family, following which she was admitted in Hospital. Are you wondering about justice for the victims of the above two cases? Justice continue to elude Dalits because the entire state machinery and (criminal) jurisprudence system informally operates on the basis of ancient cruel book Manusmriti. These wicked children/grand children of bloody Aryans and their mixed brethrens sit as judges, politicians, journalists, police, officers etc. who create multiple hurdles so much so that Dalits never get justice. In around 99% cases the victims are blamed instead. Even before conducting an investigation he makes biased statement simply because he himself belongs to the upper caste. This is just a sample. Almost every atrocity case again dalits are ignored/solved like this. I appeal to the concerned people especially those who are in North America and Europe to raise the issue of Dalits in India and extend your support to these unfortunate people. Indian government must be answerable to World Community for gross human right violations against Dalits. This entry was posted in Atrocity News and tagged anil sharma, children of vermin, dalit atrocity, dalit brutality, dalits, kyoui village, man tanti, valmiki family in uttar pradesh, vihar on March 14, 2016 by NonIndian.